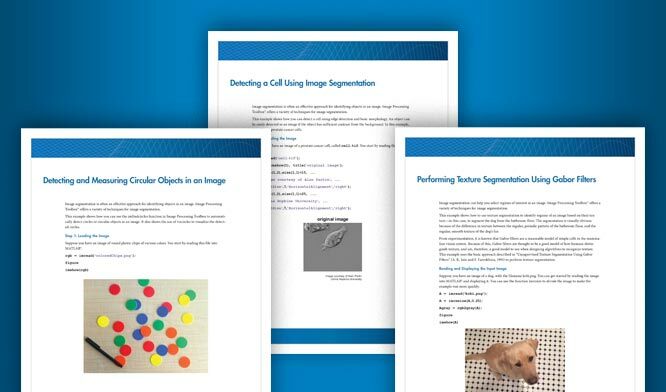 Together, Image Processing Toolbox™ and Computer Vision Toolbox™ offer four image registration solutions: interactive registration with a Registration Estimator app, intensity-based automatic image registration, control point registration, and automated feature matching. For help in choosing among the approaches, see Approaches to Registering Images. This example shows how to use the Registration Estimator app to align a pair of images. Registration Estimator app provides ten algorithms for feature-based, intensity-based, and nonrigid registration. Intensity-based automatic image registration uses a similarity metric, an optimizer, and a transformation type to register two images iteratively. Select an image metric and an optimizer suitable for either monomodal or multimodal images. Phase correlation is useful to estimate an initial transformation when images are severely misaligned. This example shows how to align two multimodal MRI images to a common coordinate system using automatic intensity-based image registration. This example shows how to align two volumetric images using automatic intensity-based image registration. This example shows how to determine the translation needed to align a cropped subset of an image with the larger image. To determine the parameters of a transformation, you can pick corresponding points in a pair of images. Control point registration can infer the parameters for nonreflective similarity, affine, projective, polynomial, piecewise linear, and local weighted mean transformations. To specify control points in a pair of images interactively, use the Control Point Selection Tool. This example shows how to use control points to align two images that differ by a rotation and scale change. Fine-tune your control point selections using cross-correlation. This example shows how to use control point mapping to register two images with a projective transformation.